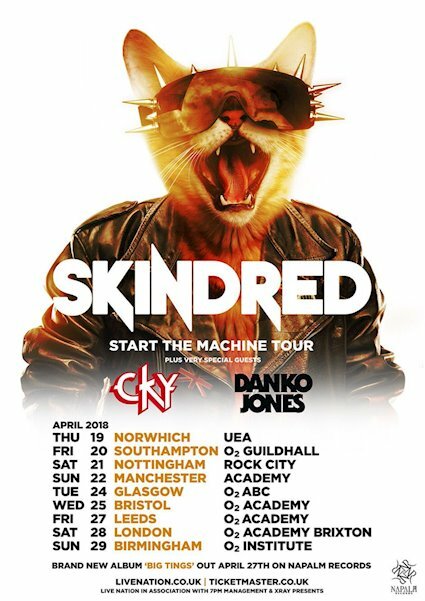 DANKO JONES is delighted to announce the band will be joining SKINDRED and CKY on the 'Start The Machine' tour. Renown for his high energy, full on performances, Danko is a great addition to this tour and will add the punky edge to what are going to be some rip-roaring shows! Tickets can be bought from all the usual online vendors. Following on from last year's release of their critically acclaimed album 'Wild Cat', which received its highest chart placings yet & saw single 'My Little RnR' become their fastest streaming single to date, Danko will be releasing new music this spring and has a new book 'I've Got Something To Say' coming out in May, featuring foreword by Duff McKagan.